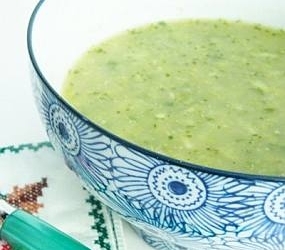 Stilton or any strong flavoured cheese can often hang around for a bit too long in the fridge so try making this lovely thick soup, which would work well as a starter for a New Years Eve Party. Add half the cheese with the seasoning and nutmeg and whiz to a smooth soup in a blender. Crumble the remaining cheese over the top, sprinkle with chives and serve with warm crusty bread.